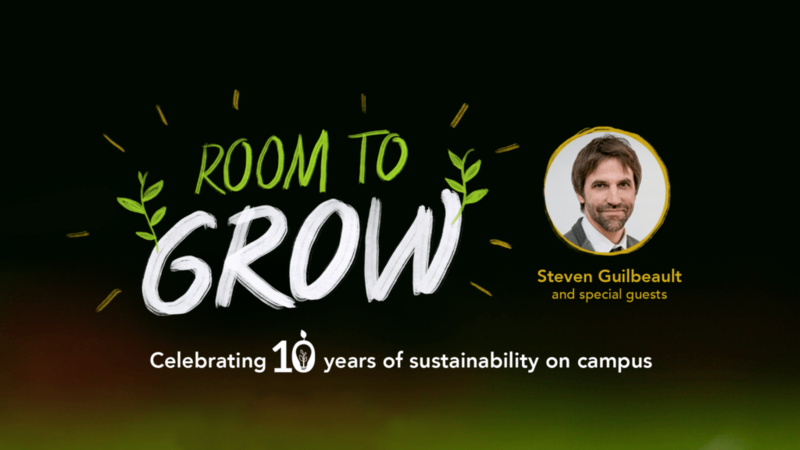 On Friday the final event in a series celebrating the 10th anniversary of the Sustainability Action Fund at Concordia took place in the main auditorium of the Henry F Hall Building. Dan Parker, founder of Rap Battles for Climate Justice, kicked off the evening with a one-man rap battle focused on topics of consumerism and sustainability. Steven Guilbeault, co-founder of Montreal NGO Équiterre, then took to the floor, delivering a keynote address that looked at the progress of climate action in Quebec and Canada. According to his presentation, Quebec has been one of the most forward-thinking provinces in Canada when it comes to climate change. The province was the first state or province in North America to put a price on carbon emissions. It was first Canadian province to adopt Californian standards, and the fourth largest user of electric vehicles in the world (per capita). “We are heading in the right direction,” he said. “But the question is, are we heading there fast enough?” While the debate over the existence of climate change has subsided, emissions have not dropped in the last three years. The Paris Accord, electric cars, green infrastructure, the “dark ages” of Harper’s government, and the moral imperative for fighting climate change were all covered in the environmentalist’s hour-long address. Guilbeault presentation included a flurry of infographics and sobering images of ice melting in the Arctic and drought in California. After Guilbeault’s talk, Mohamed Shuriye, cofounder of Sustainability Action Fund Concordia, Chantal Forgues, Concordia University Sustainabilty coordinator, Satoshi Ikeda, sociology and anthropology professor, and Erik Chevrier, phD student, joined Guilbeault on stage to discuss the progress of sustainability on campus. The SAF then awarded their two student sustainability scholarships to Vanessa Macri and Katherine Spilka. Each panellist was then gifted a lemon geranium from the Concordia greenhouse, itself a beneficiary of SAF funding, as a thank you for their participation.